While drivers may not necessarily strictly adhere to the exact PSI recommendation for their tires, a leaking tire is something that needs to be addressed and repaired immediately for your safety and the safety of other cars on the road. Typically a leak will come from a hole or tear in the tire and can be easily spotted and either patched or replaced depending on the severity. However, much more dangerous is the slow tire leak where the hole or puncture is either extremely small or in some cases completely nonexistent. Finding a slow tire leak can be a difficult process and depending on the cause, can be hard to fix, but knowing what to look for can help make diagnosing a slow tire leak that much easier. These are just a few common causes of a slow tire leak and how to spot them before it gets too bad. Valve Stem Issue– When you purchase new tires, they usually come with new valve stems since the old ones can go bad over time due to use and exposure to chemicals on the road. However, if one of the valves is bad, then there will be a slow and constant leak that comes through the base or body of the valve. Mounting Surface Damage– If the mounting surface of the wheel which is where the bead of the tire seats is damaged by corrosion or through contact on the road like a steep bump or a pothole then there can be a leak without a hole being present on the tire itself. To diagnose where this issue is coming from, simply fully inflate your tire and then pour a mixture of water and dishwashing soap onto and around the valve stem along with the inside and outside edge of the wheel. If there is a leak, any air leaking out will make bubbles in the soapy water wherever the leak is occurring. With that knowledge you’ll be able to take it to the shop to have it repaired or replaced. Hard to See Punctures– Sometimes if you run over a small nail that can puncture into the tire between the treads making it near impossible to see. Since the nail can still hold air in, it will make any leak extremely slow and any puncture damage harder to spot. To try and find a slow leak caused by a small puncture, use a mixture of water and a dish soap and spray the tire and check for any air bubbles that are produced and note where they appear to quickly patch the hole before taking your vehicle in to be serviced. If you believe there may be a slow leak in one of your tires, you can also tighten and check every valve and pin on them to make sure they are tight and functioning properly. Also double-check the seal between the tire and the rim to ensure that no air is escaping through a bad seal. 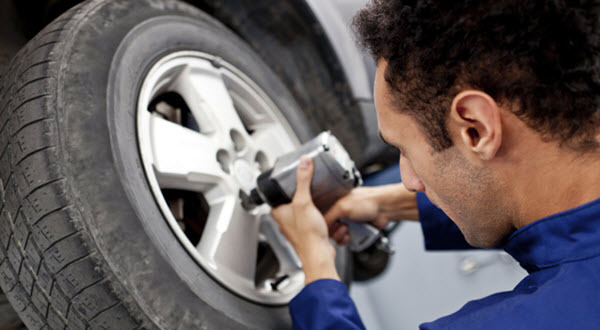 Depending on how new your tires air, they should be covered by warranty so you can always have your tires repaired or replaced by the shop you purchased them from or, if you must remove the wheels to inspect for the source of the leak, you’ll want to leave that to experienced professionals unless you’re certain you can manage it. Is it ok to drive a vehicle with slow tire leak? Another commonly asked question is if it’s safe to drive a vehicle that has a slow leak in one of the tires, the straightforward answer is of course; no it can be extremely dangerous to drive on a flat tire. If you’re driving on an under inflated or flat tire, the tire will become a blowout hazard. In the event of a blowout, you’ll lose control of the vehicle and it becomes extremely dangerous for you and also other drivers on the road. 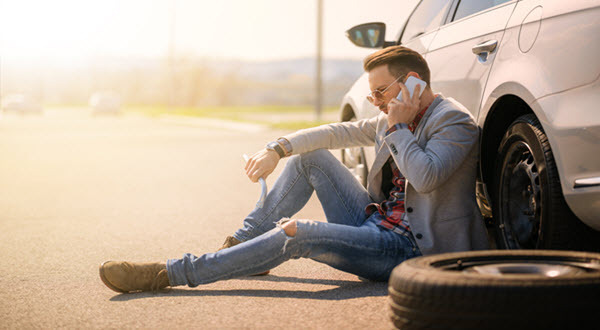 Harder to spot and repair than the obvious holes and tears in a tire, a slow tire leak can be an extremely dangerous condition to drive for a prolonged period of time. Obviously it may take longer to notice that a slow leak may be occurring but once you do, knowing the signs to look for to diagnose the cause and having your tire repair or replaced as fast as possible will minimize the potential damage and hazards for you and other drivers alike.